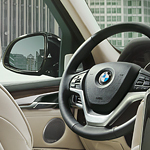 There are so many amazing features to enjoy in the BMW X5. If you find yourself in need of carrying around a few friends, then you'll be glad to know that the X5 now has available 3rd-row seating. This means that there is now room for you and 6 of your friends to get where you need to be in style and luxury. To make the ride more enjoyable, there is a bevvy of convenience features packed into the cabin. These include heated and cooled cup holders, heated steering wheel, and Harmon/Kardon surround sound audio system to welcome everyone to an audio wonderland.